Demand for jet engines is taking off. Domestic airlines have relied on up-fitting or remodeling equipment originally constructed in the 1970s or later. This generation of equipment is slowly approaching its expiry. And internationally, travel tastes have changed. Airlines are one-upping each other to offer the most top-of-the-line luxury flights which are incorporating features including personal compartments with beds, full-service bars, and incredible food options. On a fundamental level, this means that the aircraft industry needs more jet engines. And GE Aviation is getting ready. The company announced earlier this year that they would be expanding their operations and output in two North Carolina facilities which manufacture materials or components for jet engines. Fortunately, these investments are tailor-made for conducting an economic impact analysis: We’ve got jobs, dollars, a specific industry, and a specific geography (North Carolina). But that got us to thinking here at IMPLAN—in an industry like aircraft manufacturing with operations all across the country, how does an economic activity like this in North Carolina affect economies elsewhere? Most commonly, impact analyses you’ll find online follow a rather straightforward input-output methodology wherein economic impacts are calculated and totaled for the entire region—whether country, state, county, congressional district, zip code, or some combination of any of the above. This approach gives you a big-picture look at economic activity in a region but it doesn’t show you which areas of that region might be more affected than others. To get a look at how sub-regions might be disproportionately impacted, we’ll have to use a technique known as multi-regional input-output or MRIO, for short. In this methodology, subregions are defined and related to the subregion in which the initial (direct) impact takes place. Then the calculation process examines the effects of the direct impact as regional trade between subregions and the primary region while accounting for indirect and induced impacts. In short, the MRIO reveals the winners and (relative) losers in a given region. For our very simple MRIO analysis, we defined “the southeast” as including North Carolina, Virginia, South Carolina, Tennessee, Mississippi, Alabama, Georgia, and Florida. Click on a state in the heat map below to reveal the resulting total economic impact for each state in the study region. Surprisingly, Florida is the most impacted region outside of North Carolina, while South Carolina sees almost no impact at all (impacted industries in South Carolina include a few restaurant sectors so it seems likely that once or twice a year someone employed by a company in GE’s supply chain stops off somewhere in the palmetto state for a quick lunch). 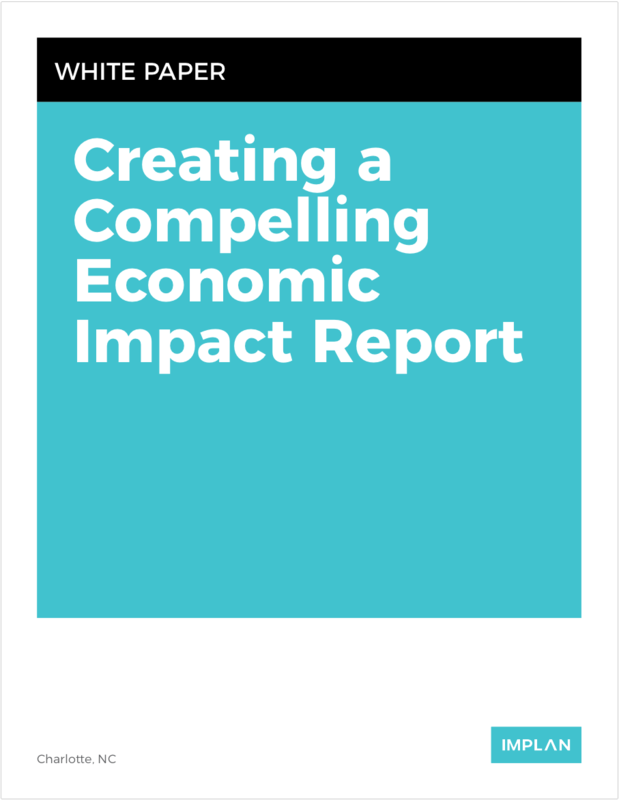 When it comes to impacted industries by total impact (including direct, indirect, and induced economic impacts), what follows describes how that breaks down for each state. Taking a look at the most impacted industries helps paint a portrait of how neighboring economies are structured around providing the goods and services to the supply chain that supports the direct impact as well as how workforces are distributed regionally. The direct impact will be zero for all states except for North Carolina because the initial shock to the economy will be fully spent in that state. Don’t let the zeroes deceive you—even though the economic impacts are scant for this state, employment impacts tell a slightly different story. GE’s Economic impact supported 10.5 job-years (6.6 indirect and 3.9 induced) in South Carolina which distribute among several industries. The employment impacts highlight a network which reacts to and is vitally linked with activities in South Carolina’s northern neighboring state. This is only a small and incomplete look at GE Aviation’s economic impact on the southeast. There are tax impacts to account for, industry linkages to explore, and social accounts which would reveal a whole lot more about how the southeastern states are connected economically to each other. But even this limited snapshot of the aviation industry demonstrates that taking a big-picture approach to economic analysis, although methodologically sound and valid, misses out on describing the distribution of an impact across subregions. But relying on MRIO when it’s most applicable will highlight more detailed—and often, more interesting—results.